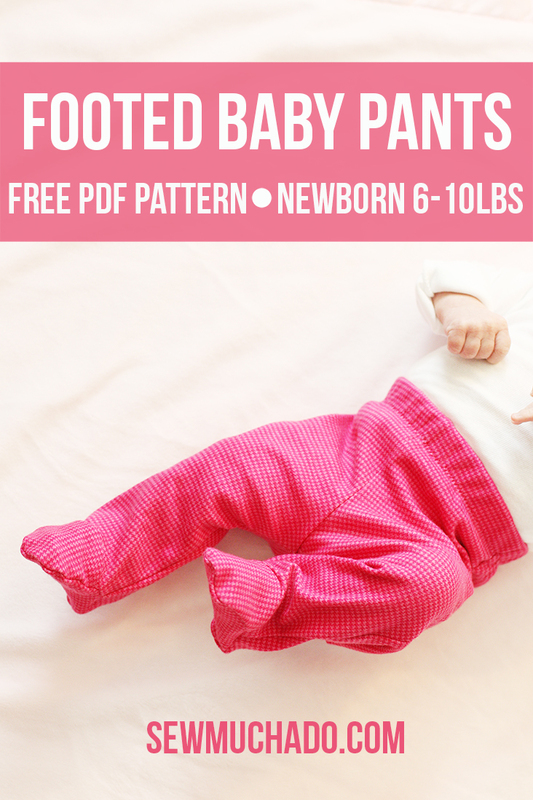 As promised, today I’m sharing a free footed baby pants pattern! 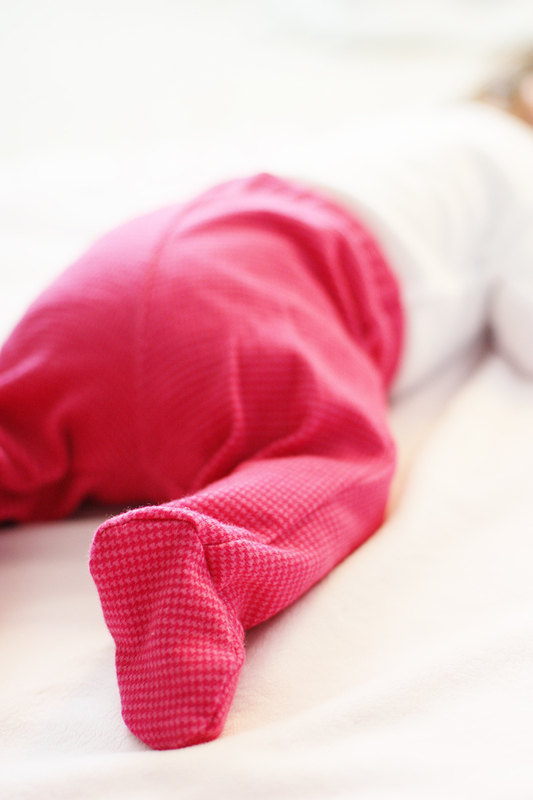 If you hate trying to keep socks on a baby’s feet as much as I do, you’ll love these little pants! They’re super comfy and will keep a baby’s feet nice and toasty. The pattern is sized for newborns, from 6-10lbs (Hattie is just over 10lbs now and they still fit quite well), and make great baby gifts! In 6 easy steps, you’ll have a pair whipped up in no time. 1″ elastic – 14″ in length – Tip: I like to buy large rolls of elastic like these – it saves a ton of money, and makes it a rare occurance to run out of elastic! Download the pattern HERE and print it at 100%, ensuring the 1″ test square is printed correctly, and tape pages together along markings. Please remember this pattern is for PERSONAL USE ONLY. 1. Right sides together, pin and stitch each foot (top) piece to each pant front at ankle curve, matching ankle marks and stretching ankle curve to fit foot piece. The convex curve on the pant front ankle will stretch outward to fit the foot top piece. 2. Right sides together, stitch each front piece to each back piece at inseams and outseams. 3. Right sides together, place one pant leg inside the other, matching raw edges of front and back crotch curves. 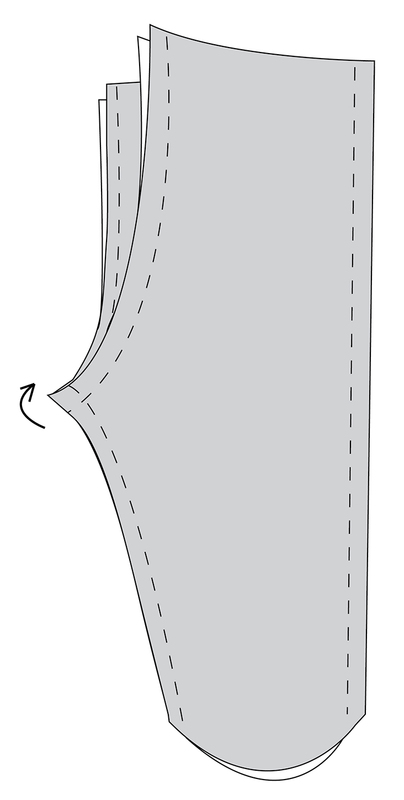 Pin and stitch crotches together with one continuous seam, from top of front to top of back (or vice versa). 4. Turn each pant leg wrong side out. Right sides together, pin each sole piece to bottom of each leg opening, matching heel and toe marks. 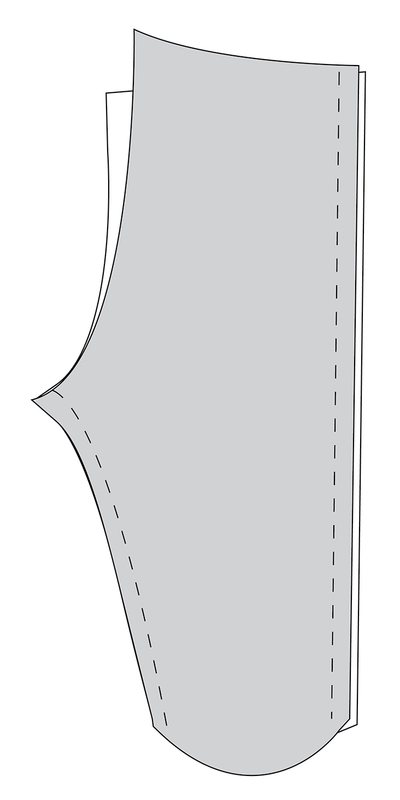 Stitch together, stretching bottom of leg opening as needed to fit curves of sole. 5. Overlap ends of 1″ wide elastic (14″ in length) 1/2″, and secure together using zig zag stitch. 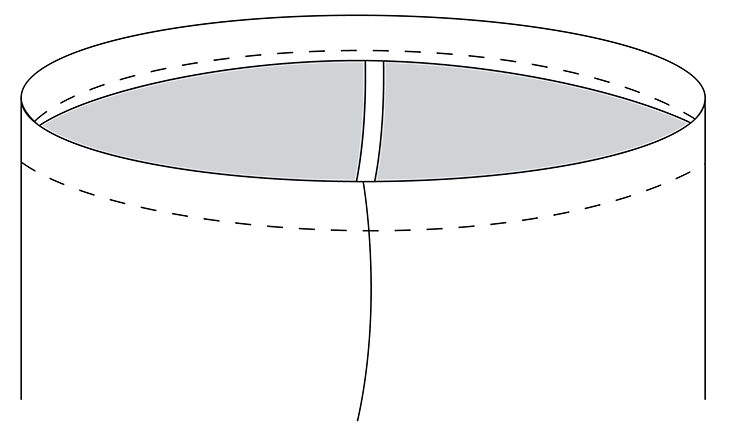 Mark both elastic and top of pants in quarters and pin together, matching quarter marks and placing elastic close to raw edge of top of pants. 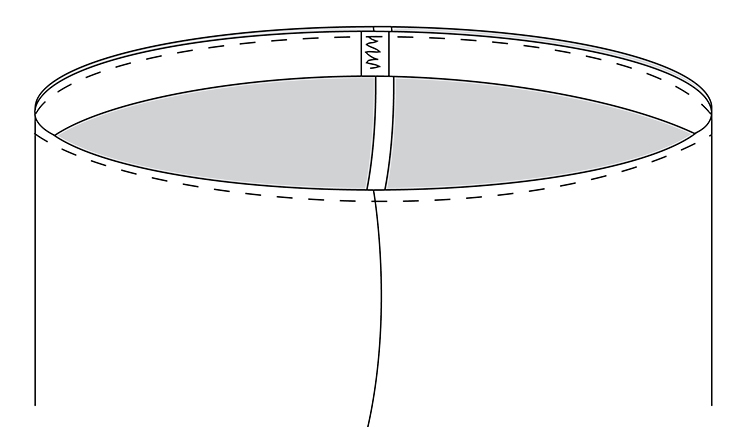 Stretching elastic to fit top of pants, stitch elastic to pants with zig zag stitch, 1/4″ from top raw edge. 6. Fold elastic and top of pants toward wrong side of pants. Stitch top folded edge in place by zig zag stitching around folded edge (stretching elastic to fit), close to edge of elastic. And that’s it! 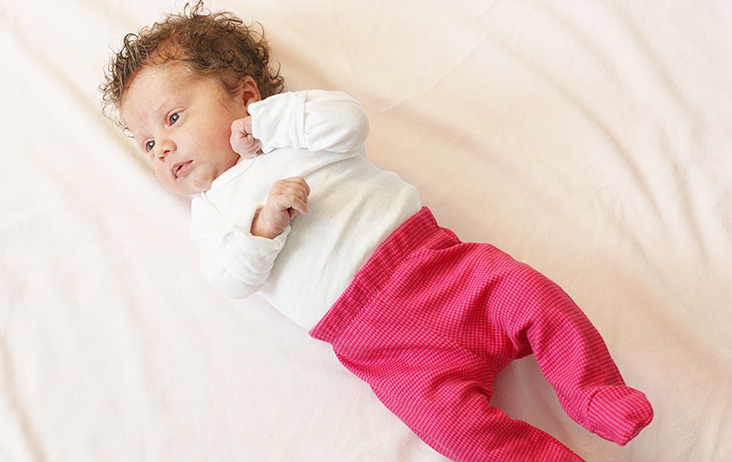 A cute, quick pair of baby pants that will guarantee snuggly toes :). Make sure to tag @sewmuchado on Instagram when you show off your pants! Thanks for doing this! I have lots of babies being born around me, so this will come in handy. Love this! I am going to be having a boy in September so this will be perfect! I love this pattern but I can’t get the pattern to open. I also can’t find the pdf format. I would love to make these baby pants. I have been looking EVERYWHERE for a pattern like this! I have #2 on the way and despiiiise baby socks! Wow I wish a million times over I had sent his pattern 6 months ago. Its so hard to find these in the store and I LOVE them, socks on a baby really never works! Hooray! I love footed pants too and have been too intimidated to try to make my own pattern. My little girl just got to 10 lbs so I’m glad you mentioned that they still fit well. I bet I could just make the elastic a smidge bigger and they’ll fit even longer; her legs are short so I’m sure length will be no problem :) Thanks for sharing!! Baby #2 is coming in October so these will be perfect! I am going to scale it a little bigger as big brother was over 9 lbs when he was born. We are hoping for smaller, but you never know! :) thanks again for the free pattern! These are super, I have always loved “footy-pants” as my kids used to call them! Just made a pair for my first grandchild, so delighted! They make so much more sense than “babygrows” which have to be changed entirely (so often!) for wetting etc, only half of bub needs to be changed that often! PS Is there an easy way to increase the size? Mine are tiny, newborn..but my next pair I want to try bigger! Thanks. I wonder if they would fit a newborn who wears cloth diapers? Just made these footed baby pants for a present for a gal at work. They came out so stinkin’ cute! Paired it with a little shirt from Sew Baby pattern. I think it turned out perfect. Thanks for sharing! Hi Erica, the link is working for me, and quite a few others have successfully accessed the pattern today, so it may be an issue with your computer’s settings. 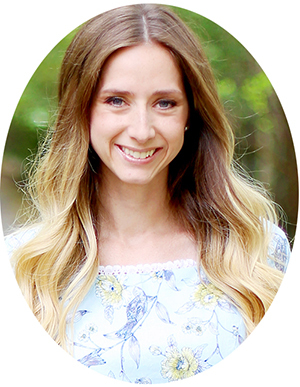 The link should take you to Craftsy where you’ll be able to download the pattern for free. Let me know if you have any questions or still have troubles! That is so strange. The link is still working fine for me, and the pattern has been downloaded many times this week, so I’m still guessing it’s something to do with your computer. You can try going to Craftsy.com and searching for the pattern in the top right search bar, and it should pop up that way! Super cute! I have a grandson due very soon & will add these to the sew list. Thanks for the pattern & tutorial! I can’t figure out how to fit the pieces together! I’ve been sitting here for 25 mins trying to fit the foot to the front piece, and after I couldn’t figure that out, I tried fitting the front and back pieces together like the picture, and it just doesn’t fit together like that, even when I try to fit the paper template pieces together. I don’t get it! Help me please! Hi Kayleigh! First, I would double check that you are printing the pieces at 100% and not scaling them. Also, be sure you are opening and printing the file from Adobe Reader (other programs such as Mac Preview are notorious for printing issues). When fitting the foot to the front ankle, the front ankle will have to stretch to fit the curve of the top foot piece. Also, make sure you cut your pieces with the greatest degree of stretch going the correct direction (as indicated on the pattern pieces), or it will be tricky to fit them together. Hope that helps! Hi Lisa! 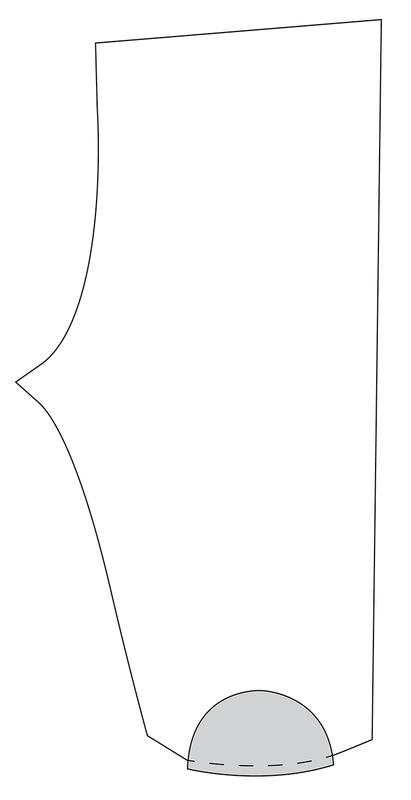 The concave curve of the bottom of the ankle will need to stretch to fit the convex curve of the foot top piece. I’m having trouble with this part as well. So the whole one side of the ankle piece has to fit within the little curved cut out area on the front leg pieces? Thanks. Yes, you are correct! The inverted curve on the front of the leg bottom will need to stretch to fit the convex curve of the top of the foot piece. It looks a bit funny before it’s sewn, but will make sense once you see it finished! Just wondering how much stretch is needed in the fabric? I have some 100%cotton knit which is a one way stretch, maybe 25%stretch and not sure if this will work or if i need a fabric with a bit more give. Hi Claire! 40-50% stretch would be ideal, but you may be able to get away with 30% as well. 25% would probably not give quite enough stretch, and might make it difficult when sewing the feet to the bottom of the pants, as the curves have to stretch a fair amount to fit eachother. I hope that helps! How hard would it be to scale this pattern up for older kids or an adult? Any idea how would I go about doing it? My 3 and 7 yr old would love to have some and I wouldn’t mind having some footed pants for myself in the winter. I would use jiffy grip for the sole piece so no one slips and falls. Hi! 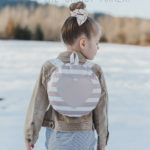 Because the body does not grow proportionately from a baby to a 3 or 7 year old or adult, I wouldn’t recommend scaling this pattern up, as you wouldn’t get the proper fit. I think it would save you some time to use an existing pattern for those sizes, and alter them to add the foot pieces. I know that Peek-a-Boo Patternshop has a pattern for footie pajamas that you could probably alter into just pants as well. Hope that helps! When you write “ensuring the 1″ test square is printed correctly” What do you mean by correctly? When I print it the Square is about 2,4 cm. Is that correct? I can’t thank you enough for making this pattern available. I’ve printed it off and tomorrow having a big cutting out session ready to make a few dozen leggings to give to newborn babies of refugee families in our area. Dear Abby, thanks for the tutorial and pattern. May I know the size of paper to print the pattern and can I use 100% cotton fabric to sew ? Thank you so much. Hi Beryl! The pattern will print well on either letter or A4 sized paper. I wouldn’t recommend 100% cotton if it’s a woven and not a knit, as it has no stretch, and this pattern is designed for knit fabrics. The fit won’t be correct if you use a fabric without stretch :). Hi! I haven’t graded this up to larger sizes yet, but it is on my to do list and will update this post if/when it gets done :). Thanks for asking! I just made these! Only took me about an hour from start to finish. Thanks for this pattern! I was a little intimidated by the toe at first but your instructions are great. Step 3 is really unclear. When it says “stitch crotches together with one continuous seam” I thought that meant that 4 layers should be sewed together (which is incorrect – it’s only 2 layers). Then, something doesn’t work placing one leg inside the other. If both legs are wrong side out and one is placed inside the other, the order of the 4 layers is inside/inside/outside/outside, not inside/outside/inside/outside (like the graphic shows). One leg ends up the wrong direction when you open it up. The fact that step 4 says “turn legs wrong side out” makes me wonder if something in step 3 is supposed to be the opposite. 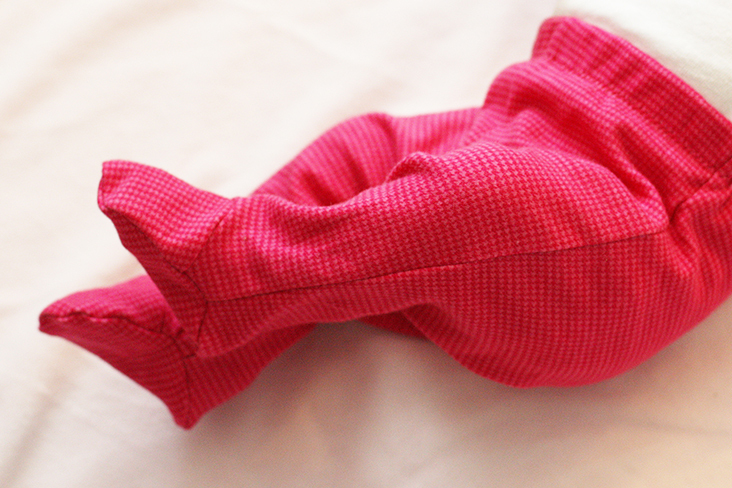 I got it to work by placing both legs right side out and sewing one seam then flipping inside out to do the other. Hi April! Sorry you’re having troubles, I’m happy to help clarify! I’m wondering if you missed the phrase “from top of front to top of back (or vice versa)” in step 3? If so, I could see why you might think all four layers would be stitched together. 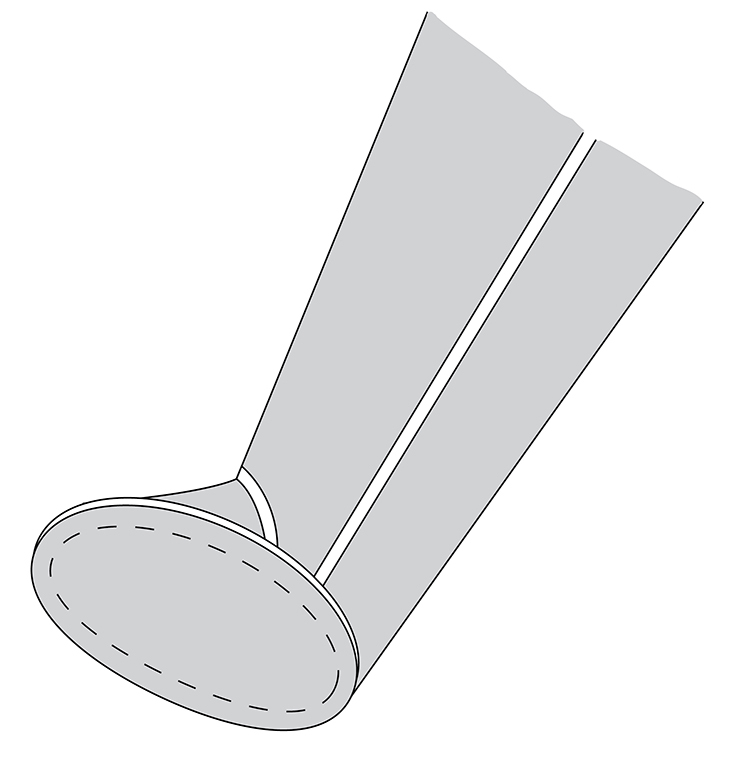 At the beginning of step 3, it instructs “right sides together”, so if you were placing both legs wrong sides out, it will not be correct (the inner leg will be right side out before it’s placed inside the other leg. Hope that helps! Thank You for the pattern. I tried it today but suspect the pants may be too small for my 1 month old granddaughter. Do you have a larger version available? Hi! I love the pants. Very quick and easy. However I have 1 question. The top of the back panel is higher than the front. I sewed the front to the back matching the crutches but the tops aren’t level. Am I doing something wrong? After sewing the crutches are we supposed to match the tops on the other side. Will this cause creases to form? Hi Akua, I’m not sure if I’m understand correctly, but the back of the pants has a higher rise to accommodate a baby’s diaper. However, the side seams from the front and back should match up perfectly when sewn together, without any creases. The front and back crotches should not be sewn to each other, the two front pieces will be sewn together, and the two back pieces will be sewn together – does that help? omg, I just stumbled on this site by mistake and I love it!!! I’m not a DIY type of person, but this site really makes me think I can be….Thank you! Hi Rowan! I haven’t noticed the feet seeming bulky at the seams, especially with the use of a serger, are you using regular serger thread? Thank you so much for this pattern! Just made 2 pair for my Grandbaby who arrives in April. I bought a pattern with a footed romper and made that but the feet in your pattern are SO MUCH EASIER! Very impressed! So glad to hear, thanks Dawn! Is it just me? When I sew the crotch seam I end up with a very odd shape. Your tutorial pictures show the waistline to be a nice even circle. That’s not what’s happening with mine. At the center back seam I have a point like a sharp arrow and at center front it dips into a shallow ‘v’. It’s impossible to sew the elastic to a shape like that. Hi Sam! There will be a angle at center front and back, but slight enough that the elastic should easily be able to be eased to fit it. If you’re having trouble with that, you could trim the “point” at the center back, and trim the center front to be more rounded in shape. Hope that helps! Okay, thanks. I thought I’d done something wrong. Hi! Why am I having such a hard time attaching the top foot part to the front part of the pant? I feel like an idiot…but I’ve literally spent an hour trying to stretch my knit and get it to work together and it just won’t. I’m determined to make the pants though so I would love any advice or help! Hi Ashley! It sounds like your fabric may not have quite enough stretch it you’re having trouble getting them to fit. 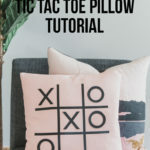 If it does have a lot of stretch, I would double check that the greatest degree of stretch is going ACROSS the width of the pants – otherwise it will be very difficult to get the ankle and top of foot piece to fit each other. Let me know if that helps!